I cursed myself for waiting so long to read it and to discover John Green. I can safely say it’s one of the best YA novels I have read. I don’t know what I was expecting but I wasn’t expecting this. This book really make me laugh out loud many times, it made me fall in love with the characters. Quintin (Q), Ben and Radar are friends who are in their final senior year. Q and his friends are not the popular kids , but they do have fun and are almost comfortable in their own skins which makes it a refreshing approach on unpopular kids in YA novels. Q is in love with this firecracker of a girl called Margo. She is everything Q is not. Although they were good friends when they were kids as they lived next to each other, they kind of drifted apart as they grew up. Margo became the popular girl. On the outside she seems perfect, but beneath that perfect exterior is a girl who is very different from what Q knows and loves. When she disappears leaving clues for Q to find her, he starts realizing that there is a lot more to her than what appears on the surface. Q becomes obsessed with finding Margo and as the book progresses we get to know more about Q’s relationships with his friends and his parents. Paper Towns is the kind of book that makes you want to love the author for creating characters like these. The humor is delicious and as I said before I was laughing throughout. Even my husband was intrigued and asked me to keep my copy for him instead of taking it back home. What is the best part of Paper Towns is that even underneath all this humor is a sensitivity and warmth which very few authors can achieve. If you haven’t read John Green, do so now. Even if you don’t read YA, you simply cannot go wrong with John Green. Cannot wait to read his other books. This entry was posted in Books, Reviews, United States, Young Adult. Bookmark the permalink. I have a couple of John Green books, so I thought I might have this one, but I don’t. I’ll have to move one of those that I do have up my TBR pile. Wonderful review! I remember having a similar reaction when I read my first Jon Green, An Abundance of Katherines. I haven’t read PaPerTowns yet, but it’s really close to the top of my reading list! I know, since I started blogging I have been wanting to read him. I should someday get a copy. Great review. I am not a huge YA junkie.. but this review makes me want to read the book.. This is the only John Green book I have read and I regret that–I need to read his other books! I really enjoyed reading Green’s An Abundance of Katherines earlier this year and look forward to reading more by him. He is such a great writer and seems like an equally great person. I am glad you enjoyed this one! I’ve had a hit-and-miss relationship with John Green. “Paper Towns” will eventually be the tiebreaker, but I’m worried to approach it. 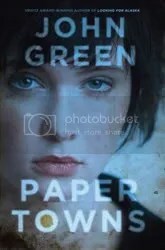 I’ve learned to appreciate Green from his blog and internet activity, such that I suspect it will be far more disappointing if “Paper Towns” does not deliver. This review seems to indicate that it will… Looking forward to it! I never read his blog before but after reading the book I did. I know what you mean. He seems like so much fun on the internet. I haven’t read any of his books even though I’ve heard great things about them. I too don’t know why I have procrastinated on his books for so long. I need to try John GReen and this is the one I have noted to try first.